After the excitement of fishing Hendre Park Lake on the previous weekend I was very keen to get out there and use my pole for the first time in over a year. Improved grip, strength and dexterity meant that I could now try out a method of fishing I really enjoyed. On inspecting my spare top sections however I found that a year or more of abuse (or rather neglect) meant that some of my finer elastics had perished. This did however present a perfect opportunity to visit another local tackle shop, and as it was in the middle of Ebbw Vale Festival Retail Park I had no idea what to expect from Tacklesmart. A welcome sight among the various clothing shops Festival Park has to offer! Tacklesmart is quite a large shop given the slightly unusual location, nevertheless from the outside you can see there is a lot going on inside. The walls are crammed with rigs bits, lines and hooks. There is also an impressive selection of groundbaits, pellets and additives to choose from. (There must have been a Baittech delivery earlier that day). I was also impressed to see “bargain boxes” of essential rig bits and took the opportunity to trial some new Fox wide gape hooks. (4 packets for £2.99, bargain) I also bought a Drennan match caty for £6.65 which is slightly cheaper than I have seen it elsewhere. 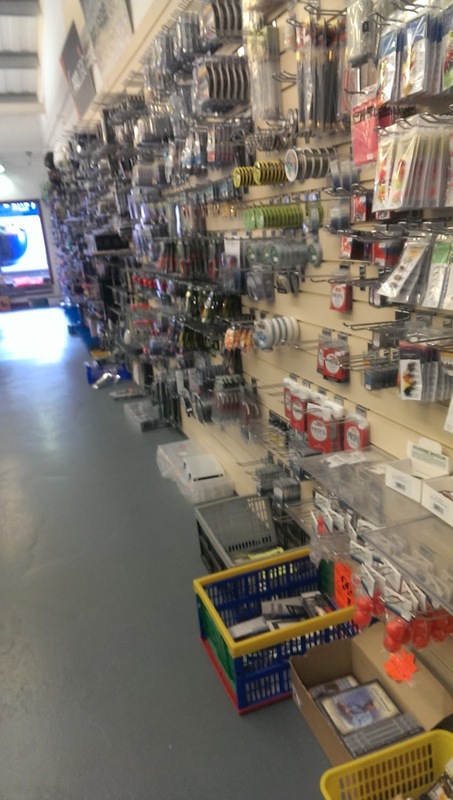 The shop also had a good selection of coarse fishing accessories, with a lot of mainstream brands (Guru, Drennan, MAP etc) which meant there was no doubting the quality of the items. Having a further look around the shop there was a good selection of Carp equipment too, with leaders, leads, hooks, mono and braid. Not to mention the usual rod and reel set ups (for all types disciplines of fishing) which are on stands throughout the shop. There is also a small selection of sea fishing equipment and you could easily top up your rig box with the bits that were on sale along the far right wall (I have been told that the Tacklesmart in Aberdare stocks a more extensive range of Sea fishing equipment, but I am yet to visit this store). The far left had corner of the store also contained a small amount of fly fishing gear (lines, leaders and flies). This in no way means the selection was meager, but the store was clearly catering towards the coarse and carp angler. It was pleasing to visit a shop and actually want to look around to see what was on offer. That being said I was looking for a specific type of hook (Kamasan B611) and couldn’t find any, even though they had the rarer B511 hook. Perhaps they were simply out of stock. What was also odd was visiting a Fishing shop and being told that they didn’t sell maggots. Perhaps it had something to do with the proximity to other shops. The server did however apologise for the lack of bait and directed me to a nearby pet shop where I could purchase any maggots that I wanted. The server also had some knowledge of the fishery I intended to visit and spoke of what he knew of the venue. Baittech delivery in the top corner! 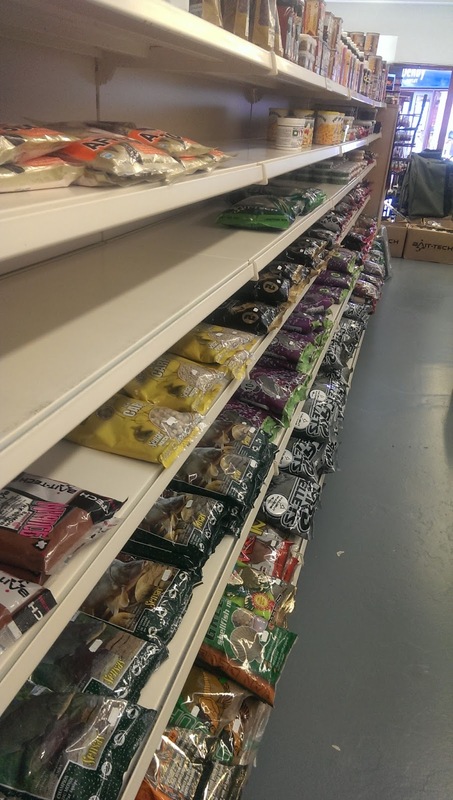 The store itself does sell frozen bait for both Sea and Pike fishing but that is the range of hook baits (besides the conventional, non perishable coarse fishing bait). I would certainly recommend a visit to Tacklesmart if you are in the area. Not only will you have a large selection of equipment to look through but you may also pick up a bargain. If the store had sold Maggots and Casters it would have been one of the better shops I have been in since being back in South Wales. Tacklesmart is an excellent store if your a game/predator angler! always a bargain to pick up there..I would give it 4.5 out of 5 for game/predator gear.They also sell fly tying stuff , plus the staff are very friendly. FYI it is only the swansea store which is closing. Tacklesmart ebbwvale as now got a new owner Paul as bought it and it now stocks maggots and a lot more .. every time i go there i feel like a kid in a sweet shop..
Next story Now featuring on the Fish Here App! Previous story Fishing Basics – Plumb the depth – Using a plummet.